I remember giggling as a kid when someone would order thePu-Pu Platter at a Chinese restaurant. I must admit the name still kind of cracks me up. For those of you uninitiated in things Pu Pu, the platter is a sample tray of appetizers – egg rolls, spare ribs, chicken wings, fried shrimp, beef teriyaki, and on occasion, crab Rangoon. 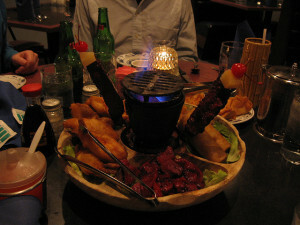 The food is arranged around a flaming hibachi, which adds some drama and flare. The key concept here is sampling different things and seeing what you like. So what do Pu Pu platters have to do with career transition – other than one option for binge eating when the going gets tough? A client recently told me, “I think one of your best pieces of advice is that I have time to ‘sample’ things and learn by actually dabbling in various areas to see what I truly like to do.” She inspired me to share some concrete ways you can dabble a toe in potential career waters instead of risking a big plunge into the unknown. Toe dips into other career directions can include taking an online course, attending a conference, shadowing a mentor, trying out relevant skills, and many other possibilities limited only by your imagination. One of my clients, an anesthesiologist, was interested in becoming a motivational speaker. To test the waters, I suggested she join her local Toastmaster’s Club, which offers a great environment for learning public speaking. At her very first meeting, due to a lack of speakers, she volunteered to give an impromptu speech. The rest is history. She discovered a passion and talent for speaking, and after winning at her district level, she will be competing in the International Toastmasters competition in Kuala Lumpur. Her motivational speaking business is on the launching pad. Other clients have taken courses in areas such as medical and fiction writing, wellness coaching, functional medicine, informatics, web design, financial analysis, leadership, consulting, small business start-ups, and internet marketing, to name a few! For almost anything you can think of, there is an on-line course. I recently saw e-courses for gluten-free baking and dog massage. Let’s say you’re curious about a few different career areas – perhaps pharma, informatics, and medical writing. Each of these has a variety of on-line courses you can sample without leaving home or spending a lot of money. Many are self-study, go-at-your-own-pace. If, after taking one of these courses, your interest is piqued, consider attending an annual conference or a chapter meeting. You will have a chance to gauge whether or not you feel you belong in this area. Are these your peeps? Do you feel like you fit in? Do the conversations leave you wanting more? To help gauge your interest level, pay attention to what happens to your energy level. Do you perk up and want to read more about x, y, or z? Are you excited about trying out this course or attending a conference? Or do your shoulders slump and you start yawning uncontrollably? Our energy naturally wants to flow in the direction that will be compelling and sustainable for us. It’s a great clue. Before I ever thought about becoming a coach, an acquaintance of mine was being recruited to train and then work in-house as a business coach. I didn’t really know anything about coaching, but was fascinated by the conversations. I found myself eaves dropping and couldn’t quench my curiosity. When I decided to sign up for coach training myself, the program I wanted didn’t start for 4 months. I could hardly bear the wait. It seemed like an eternity. On the first day of the course, it just felt right. I had come home. Another way to test the waters is to shadow someone established in that area. I’ve had clients visit a variety of different businesses from functional and integrative medicine practices to wellness and weight loss clinics to non-profits. You may need to travel out of the area to avoid concerns about competition. Ask enough people and approach them in the right way, and doors will open for you. Persistence pays off. Someone may even offer to create a customized preceptorship for you for a fee. This could be worth the money. Doctors have also created opportunities for themselves by volunteering on a project or in an organization. As I mentioned before, the opportunities are only limited by your imagination. I wish you all the best in creating your own Pu Pu Platter. May it lead you to all sorts of tantalizing career options. American Medical Writers Association – annual conference, online courses in medical writing and local chapter meetings. American College of Physician Executives – variety of online courses for CME credit in physician leadership and development. Quarterly conferences throughout the year. SEAK – annual Non-Clinical Careers conference as well as specialized workshops on topics such as being an expert witness, disability and file reviews, fiction writing, IME’s, and consulting. HIMSS – Heath Information Management Systems Society (Informatics/EMR) – annual conference and a range of e-learning Academy products including online courses, conference recordings and webinars. Drug Information Association (DIA)– conferences, webinars, and on-line courses covering most areas of the pharmaceutical industry.